Lamb chops have a higher profile than pork chops, but making them is just as simple. 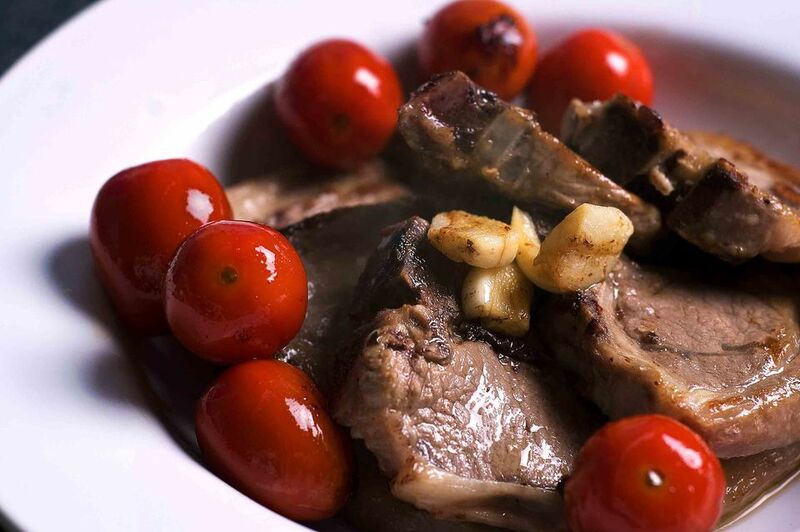 This recipe uses basic ingredients to pull together traditional lamb chops in a slow cooker. This recipe calls for tender lamb loin chops to be used but, since the cooking time is 5 to 7 hours, a more economical cut of lamb like lamb shoulder chops can be used. The long, slow cook will break down the connective tissue in the tougher shoulder cut making it succulent and fork-tender. Heat the vegetable oil in a skillet or saute pan over medium-high heat. Coat the lamb chops with flour and brown them quickly on both sides in the hot oil. Transfer the lamb chops to slow cooker. In a medium saucepan, combine the beef or chicken broth, canned diced tomatoes, minced garlic, tomato paste, and sliced celery. Add salt and pepper to taste. Bring the mixture to a boil, stirring occasionally. Pour the hot tomato mixture over the lamb chops in the slow cooker. Cover and cook on high for 30 minutes, then turn to low and continue cooking for 5 to 7 hours. Taste to check seasoning and serve the chops sprinkled with plenty of chopped parsley.